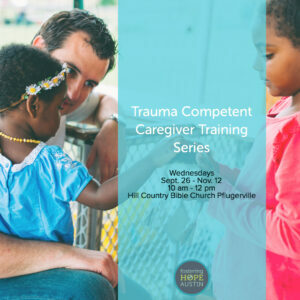 Join us for a deep dive into understanding how trauma affects the brain, body and belief system of a child and how, as caregivers, do we bring hope and healing to the children we care for. This class is 8 weeks long starting on Wednesday, Sept 26 and meeting every Wednesday through Nov 14. As a BONUS, we have two evening catch-up classes. These catch-up classes will not cover all the information but will provide a summary of what was learned during the day class. Catch-up classes are designed for spouses and friends who cannot attend during the day. These two evening classes are FREE to one spouse or friend attending the daytime class. Childcare for children 8 years or younger is available but LIMITED. Please register them at the time of purchasing your ticket.